Hill Top Home of Comfort is a 55-bed skilled nursing care facility, located in Killdeer, ND. Hill Top provides appropriate nursing care in a comfortable atmosphere. The establishment of Hill Top Home has made it possible for people in the community and surrounding areas to remain “at home” while receiving nursing care. Their mission is to provide compassionate care that extends and enhances the quality of life for residents. Hill Top Home of Comfort in Killdeer, North Dakota serves 75 patients in its nursing home facility. The staff at Hill Top took their computers to the repair shop every few weeks. Their wireless Internet cut out often, leaving staff to their back-up matrix software. Hill Top’s administrator, Gerry Leadbetter, said he felt frustrated by the unreliable technology. “In electronic medical records, IT is so important to have working. Our wireless was a huge problem in our building,” said Leadbetter. Hill Top’s Internet provider attributed the problems to the company’s computers. “Every other week, we were having to take this computer or that computer in, and it just started adding up. It was $200 here and $500 there,” Harderson said. Hill Top’s technology expenses spiked due to their outdated machines. Harderson remembers the wiring in the building wasn’t properly completed. She also realized they used old, mismatched equipment, such as monitors, keyboards, processors, servers and printers of various brands. Even more, their primary server was out in the open, atop a filing cabinet. Every staff member used the same password. “It was very unsafe,” Leadbetter said. When they couldn’t stand the unpredictable equipment anymore, they turned to Marco. Leadbetter received a reference from a colleague, and he called Marco for assistance right away. “We had a lot of problems. I think our technology goals were to be secure and have a reliable system. Those two were on the top,” Leadbetter said. After their Marco Technology Advisor established a plan, Leadbetter and Harderson felt confident. “We have what I call a ‘complete package’ with Marco. We had been piece-mailed earlier, so we needed to simplify life,” Leadbetter said. They decided to enter a lease for Managed IT. The lease allows them to update their equipment in a timely manner. “Technology is a rapidly changing sector, and the need to keep up can be a challenge. This leasing program should allow that to happen versus owning it,” Leadbetter said. “You’re going to have equipment and it breaks, but not having to do that [repair devices] every week is nice.” Getting upgraded equipment with the lease was a major advantage for Hill Top. The managed services provided them with safer solutions. “We went to being backed up not only on the main server but backed up in the cloud, which has been a huge benefit,” Leadbetter said. Although their server went down for two days during the installation period, Marco and Hill Top stayed resilient. “We can call the tech people day or night. When you work in 24/7 business, you don’t get 16 hours off to take care of problems,” Leadbetter said. 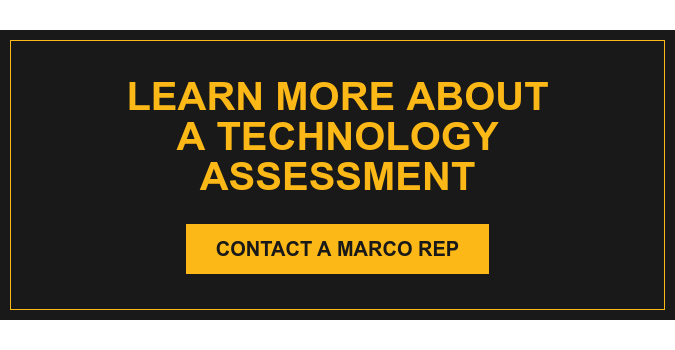 With remote and on-site care, Marco technicians resolved the server issues. Over the past two years, they have problem-solved and built a strong relationship. “The security of the IT is way better; we are better secured to comply with all our HIPPA statements,” Leadbetter said. He explained that Hill Top was built on a system with Marco, from the computers up. Hill Top employees appreciate the ability to listen to Webinars, host conference calls, use phone transferring, and monitor the cameras. Leadbetter explained the cameras have been beneficial not just for security, but for education, in watching the residents and identifying areas they fall or experience difficulties. “We covered a lot of hurdles, stuck together, and at the end of the day…we have a great system that works. As we work together with Marco, we keep improving our system, and that’s kind of exciting. Marco doesn’t just sell it to you; they help you keep it going and improve. I hope we continue to build and grow together for many years to come,” Leadbetter added.